As the first tones of the record start to resonate, you will find yourself immersed in thick, incessant atmospheres emerging from sombre plains of your inner self and the worlds around. As devouring so uplifting, and that is just the initiation of it all. The record turns out to be more and more dense as it's aural waves melt the perception of time into the infinity. Suffocating yet uplifting. The record is incredibly percussive, its pulsing beats and overall varied and well-thought rhythmic section do not allow for a single boring moment. On top of that, there lies the guitar work with its impressive layers as well as structured riffing. The tension achieved on Ex Nihilo is unique and hard to find in such dense form nowadays. 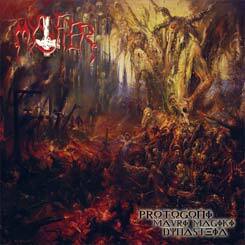 Derived from the black/death metal essence, the record follows its own unique trajectory. It can bring some names and influences to one's mind but those are secondary, the ambience of Depths Above is a world of their own. To cut it short, this is an incredible, intense debut album.